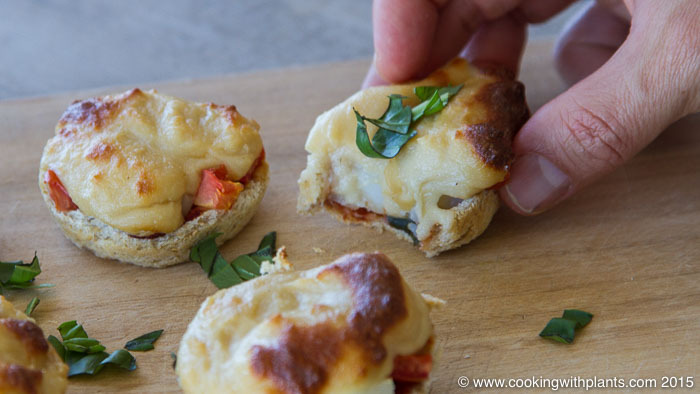 If you want to make a quick snack or have guests coming over for lunch, then these mini bread pizza bites are the perfect snack! All you need is some bread and a few simple ingredients and you’re done. Enjoy! Take your bread slices and roll them flat with a rolling pin so that you can cut 2 x 8cm (3 inches) circles out of each piece. With a small spray bottle or pastry brush, put a small amount of water onto the first piece and place it into a muffin tray. Push it down so it forms a nice tart style shape. (See video at top of this page for full cooking demonstration). Continue to shape all of your bread pieces into the muffin tray. You do not need any oil! Put a scraping of tomato paste into each piece of bread. Then top with your favorite pizza fillings. I used cooked potato, basil, tomato and some of my stretchy melted vegan cheese. Place in oven for 12 - 17 minutes or until browned on top and crispy on the base. Place them on a wooden board as this helps to absorb the moisture and keep them from going soggy. You can eat them straight away or store them in the fridge for a day and serve them cold (or reheated). These are a great snack for adults and kids alike. Try not to use watery ingredients so that the bread pizza bases stay crispy. Enjoy!